Helping those with disabilities, their family and friends experience the joy and freedom of scuba diving. Scuba diving with a disability is more possible than you would think. Some of the key skills in scuba, such as buoyancy control, can be mastered with a whole range of disabilities. The Scuba Trust has been a registered Charity for over 21 years and is run entirely by dedicated and experienced volunteers. During this time we have supported many people with a wide range of disabilities, including; Paraplegics. Quadriplegics, Visually Impaired, Deaf, Autistic and Amputees to scuba dive. The Scuba Trust has a very long and successful history of working with divers with disabilities. Our approach to diver education is (and always has been) inclusive. Weightless and relaxed, freedom from a wheelchair or mobility aid, divers can for a short while forget the world above water and share their experiences with a supportive group of qualified buddies. Scuba diving can be enjoyed by virtually anyone, regardless of physical ability. Enjoy a unique sense of freedom as you are transported into a world of near weightlessness. Visit tropical coral reefs, historic shipwrecks or just marvel in the wonderful aquatic life found beneath the waves. The possibilities are endless and every dive will immerse you in your own brand new and unique underwater adventure. The new sights, sounds and sensations on each dive will make it an incredible experience that you will always remember. 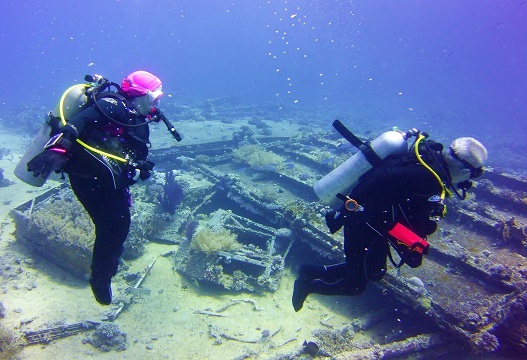 The aim of the Trust is to provide a level playing field by arranging training using PADI Adaptive Techniques and BSAC Diving For All principles along with obtaining funding to subsidise applicants who, due to long or short-term disability, encounter difficulty in finding suitable instruction and who may face a greater outlay for training and recreational diving after certification. The Scuba Trust relies on donations to ensure we can continue our work to enable our disabled friends to learn to snorkel and scuba dive. I’ve been training and diving recreationally with the team at The Scuba Trust since 2014 and can honestly say it’s one of the best decisions I have made. The team are extremely knowledgeable but are also very friendly and approachable which makes learning enjoyable. My whole first experience of holidaying with the Scuba Trust; it was amazing. The diving was only part of the holiday; what made it more amazing was the support, guidance and, most importantly, friendships that I built on over the week. Someone referred to the Scuba Trust as family and this is how it felt. I am fairly new to the Scuba Trust but this didn’t matter. I was made to feel welcome and part of the group. I made some really lovely new friends who supported and helped me in so many ways making my dream of diving come true. I am looking forward to my next adventure with the scuba trust already although I slept for most of the first week when I got back !